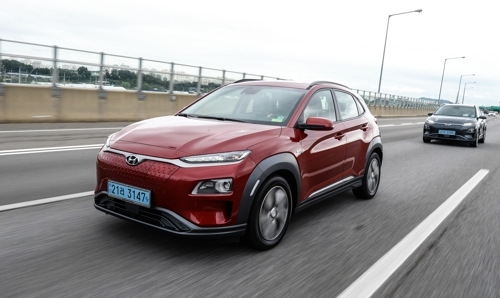 SEOUL, Aug. 28 (Yonhap) — South Korea’s biggest carmaker Hyundai Motor Co.’s new electric version of its Kona subcompact sport utility vehicle (SUV) boasted an impressive battery range and various safety features on the roads surrounding Seoul on Tuesday. During the 90-minute, 100-kilometer course through the towns of Ilsan and Paju, the eco-friendly car showed off its 64-kWh battery pack to its full advantage, with a range of 406 kilometers (252 miles) on a single charge. The lower-trim model bearing a 39.2-kWh battery is rated to a range of 254 km per charge. The long-range version takes around 9 hours and 35 minutes to recharge, while the base model requires 6 hours and 10 minutes to top off. It’s battery can reach 80 percent of its capacity in less than an hour on a special fast charger, Hyundai said. The car, which can accelerate from zero to 60 mph in about nine seconds, was very stable even when it hit speeds of 140 km per hour in heavy rain. The maximum speed of the higher trim model exceeds 160 km per hour. The Kona EV also showed off a host of safety features, such as forward collision avoidance with pedestrian detection, blind spot warning and lane following assistance. Noticeably, the new zero-emission car is equipped with an impressive semi-autonomous safety feature called “smart cruise control” with full stop-and-go capability. Inside the car, a seven-inch infotainment touchscreen displays a host of information such as energy usage and is compatible with Apple CarPlay. The screen is also in linked with a head-up display placed before the windshield. Hyundai said that despite the impressive array of features, the models comes at reasonable prices between 46.5 million won (US$43,500) and 48.5 million won, with the total going down to 29.5-31.5 million won in Seoul due to state subsidies.